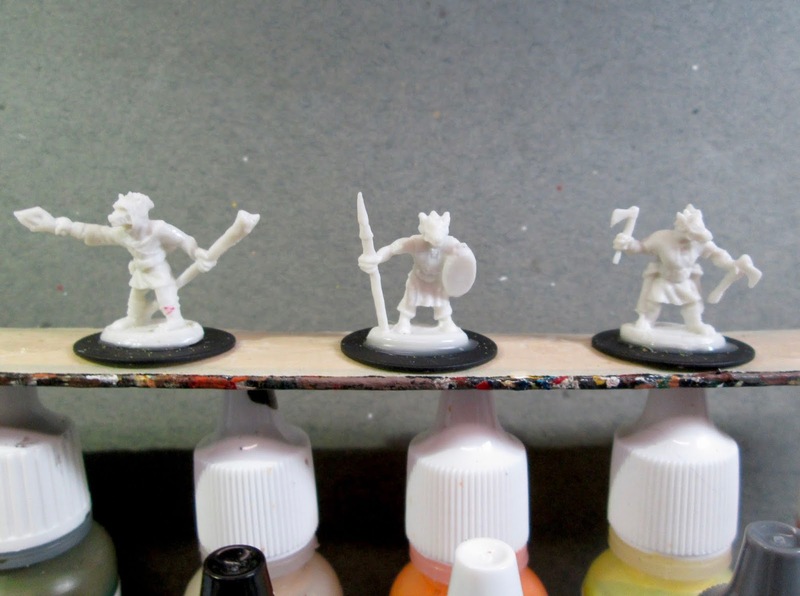 Kobolds, Part B: Bones 3 Figures | H.A.W.K.S. 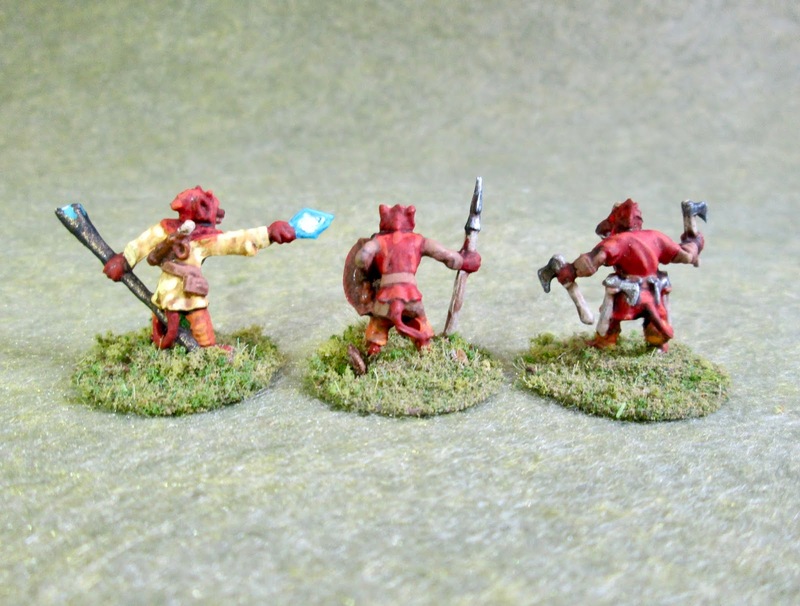 This past week I painted the other 3 of the six Kobolds from the Bones 3 Stoneskull Expansion set. I prepped the figures in the usual way; soaking them in a dish of water with a couple drops of dish- soap added, then giving them a light scrub with a soft toothbrush, and then rinsing and drying them. I then glued the figures to 7/8" fender washers with Aleene’s Tacky glue. I then glued the washers to a tongue depressor with a couple drops of the Elmer’s glue each. I began by painting the figures entirely Ceramcoat “Black”. When the Black was dry, I painted their skin Folk Art “Barnyard Red”. I then painted the tunic of the first one with Accent “Golden Harvest”, and of the second one, as well as the under shirt of the third one, with Folk Art “Teddy Bear Brown”. 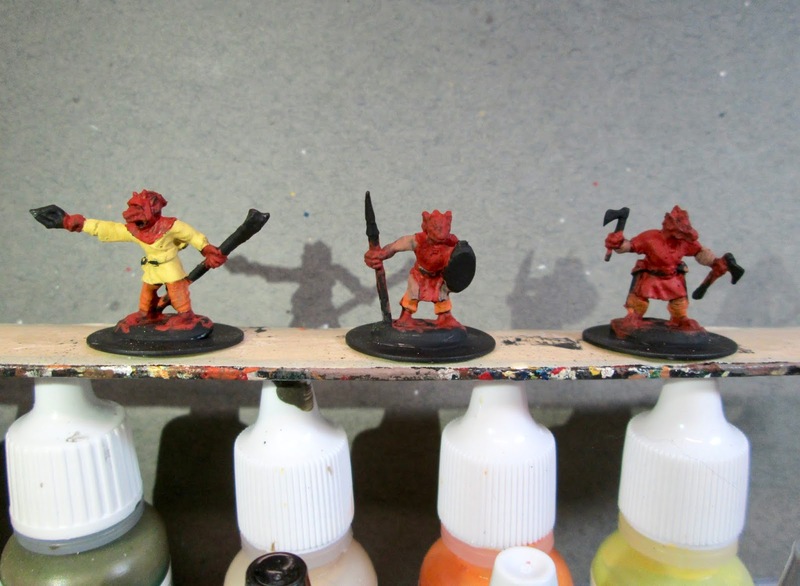 Next, I painted the hood and collar of the first one, the tabard of the second one, and the tunic of the third one with Reaper MSP Bones “Cinnamon Red”. After that, I painted any pants or leggings with Reaper MSP “Pumpkin Orange”. Next, I painted the wooden axe handles and spear shaft with Folk Art “Barn Wood”, their belts with Americana “Sable Brown”, and the wizards staff with Folk Art Colr Shift “Black Flash”. I then painted the wizard’s scroll pouch and the back of the spear Kobold’s shield with Americana “Light Cinnimon”, and followed u by painting their teeth, as well as the scroll, with Americana “Bleached Sand”. After that, I painted their horns Americana “Khaki Tan”, the front of the shield with Folk Art “ DeepTomato Red”, and the stone in the wizard’s staff with Crafter’s Acrylic “Tropical Blue”. 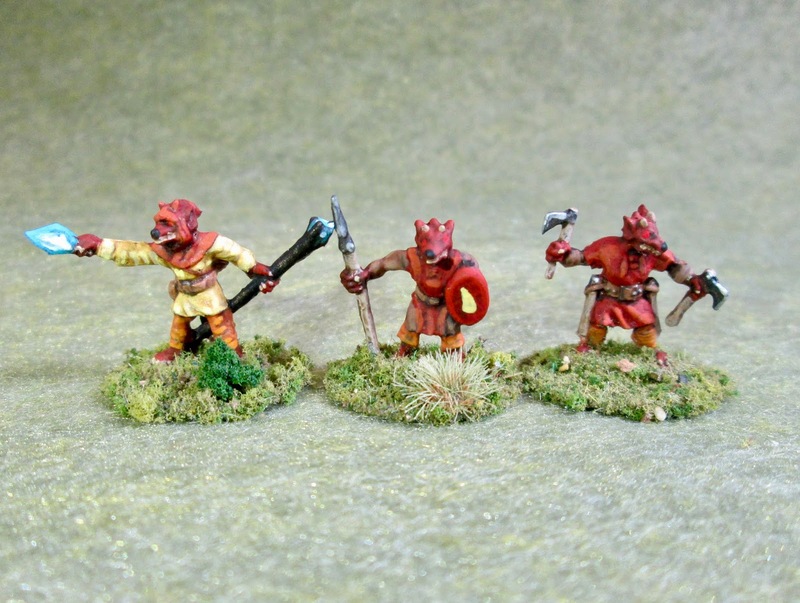 I painted the spearpoint and axe heads with Folk Art Metallics “Gunmetal Grey”; and then after the figures had a while to dry, I gave them all a complete wash with Citadel “Agrax Earthshade” wash. 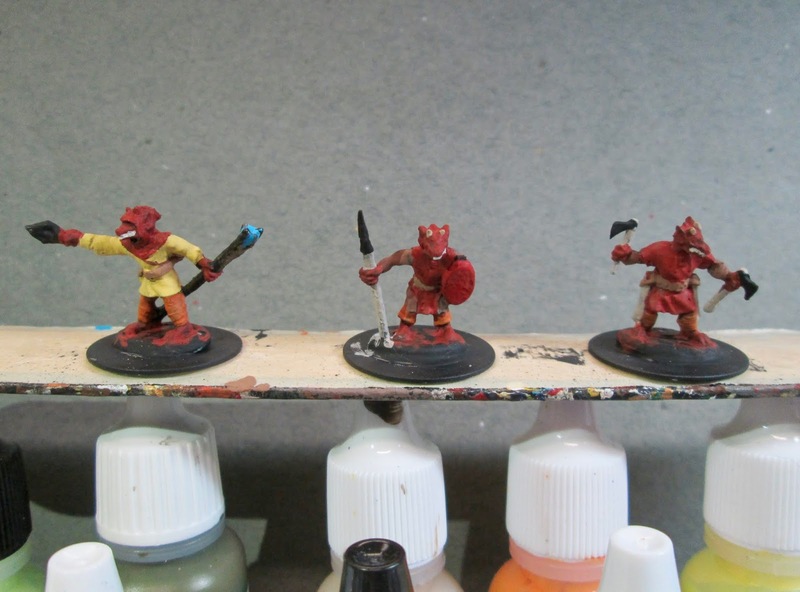 When the wash was dry, I highlighted the figures’ skin with the base color “Barnyard Red”. 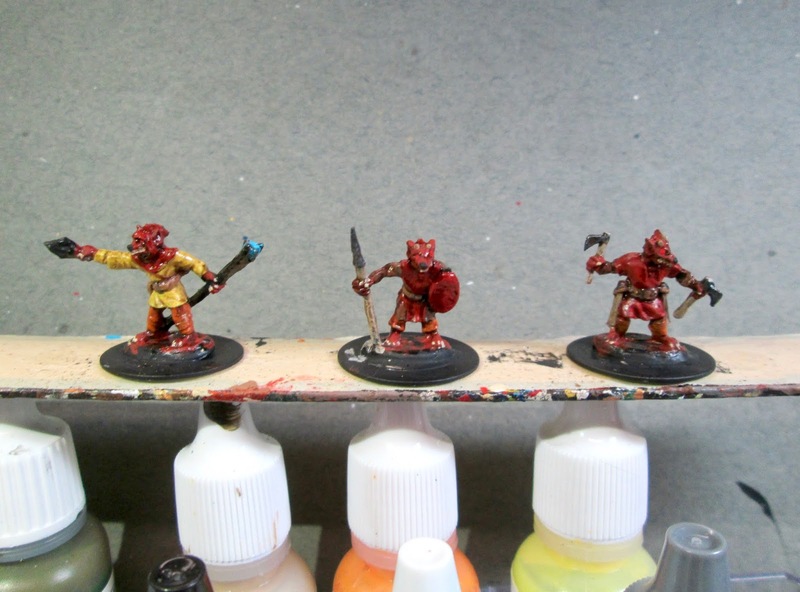 I then painted black noses on the Kobolds, and Reaper MSP “Holly Berry” dots for eyes. I also added claws in with Americana “Antique White”. Next, I highlighted the wizard’s tunic with Crafter’s Acrylic “Daffodil Yellow”, and then highlighted the pants/leggings with Reaper MSP “Hearth Fire”. I then highlighted the “Teddy Bear Brown” clothing with Ceramcoat “Territorial Beige”, and highlighted the “Cinnamon Red” clothing with Crafter’s Acrylic “Orange Spice”. The shield was highlighted with Reaper MSP HD “Rusty Red”, and then given a “Claw” design with the “Daffodil Yellow”. I then painted the flame in the wizard’s hand with the “Tropical Blue”, and then highlighted it, as well as the stone in the staff, with Crafter’s Acrylic “Cool Blue”. I then added a little Americana “Snow White” highlight to the flame. I then highlighted the spearpoint and axe heads with Ceramcoat “Metallic Silver”. Lastly, I painted the all the bases with Americana “Mississippi Mud”. I let the figures dry overnight and the next day I gave them a coat of Americana “DuraClear Matte” varnish. Then, when the varnish was dry, I used some white glue to flock the bases. Another overnight dry, and I sprayed them with Winsor & Newton Professional “Matt Varnish”. I’m much happier with these guys than last weeks. I spent a little more time with these, and I think it paid off.